History: Tenzan has managed to work his way into a main attraction in New Japan Pro Wrestling. He began his career there near the end of 1990, by fighting in a 32-man battle royal. 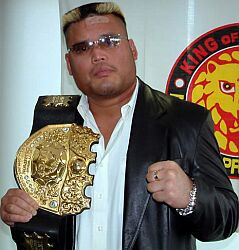 Tenzan then went to the Catch Wrestling Association in Austria, where, wrestling under his real name, he defeated Lance Storm to become the first CWA World Junior Heavyweight Champion. A few weeks later, he lost to Storm, then came back in October '93 to win the belt for the second time. Once again, Storm defeated him a few weeks later, and Tenzan headed back to the NJPW. Tenzan then began teaming with Masahiro Chono as Chono Team Wolf. In June 1995, Tenzan and Chono won the IWGP World Tag-Team Titles in a tournament, which they held for a month until the title was vacated due to Chono missing a match when his father died. In July '96, Tenzan and Chono won the IWGP Tag-Team titles again, this time beating Kazuo Yamazaki and Takashi Iizuka. They held the titles for over 5 months before losing to Tatsumi Fujinami and Kengo Kimura. A few weeks later, Tenzan and Chono became founding members of nWo Japan. For the rest of '97, Tenzan and the rest of nWo Japan continued the nWo tradition of attacking en masse their various enemies. 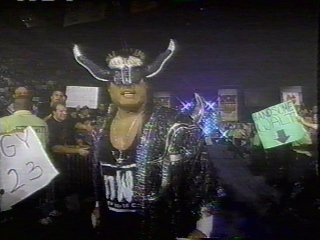 Tenzan also went on a brief tour in the United States, wrestling with WCW. Tenzan got his third chance for the IWGP Tag-Team titles in July '98 after Chono's former tag-team partner Keiji Mutoh was injured. Tenzan and Chono went on to win the tournament and the belts. A month later, they were defeated by Gen'ichiro Tenryu and Shiro Koshinaka. Tenzan continued to feud with Koshinaka, eventually getting a new partner in Satoshi Kojima (due to Chono being out with a neck injury). The two teams fought at the Tokyo Dome in January '99, with Tenzan & Kojima coming through, defeating Koshinaka & Tenryu to get the IWGP Tag-Team belts. A few months later, Koshinaka retook the titles from Tenzan & Kojima, with his partner Kensuke Sasaki. For the next year, Tenzan continued to wrestle in NJPW, feuding with Koshinaka, Masa Chono, Manabu Nakanishi, and others. He defeated Chris Benoit at the Tokyo Dome in January '00, a major victory. In July '00, Tenzan, still teamed with Kensuke Sasaki, got the IWGP Tag-Team Titles for the 5th time, winning over Manabu Nakanishi & Yuji Nagata. Tenzan & Sasaki feuded with Nakanishi & Nagata for the next few months, with Tenzan & Sasaki coming out on top. Tenzan continues to wrestle in New Japan Pro Wrestling to this day, having wrestled in April '01 at the Osaka Dome. - NJPW Tokyo Dome '95 (Battle Seven) = Tenzan defeated Manabu Nakanishi. - NJPW Sumo Hall (February '95) = Tenzan, Masa Chono & Hiro Saito won over Riki Choshu, Hiroshi Hase & Kensuke Sasaki. - NJPW Wrestling Dontaku '95 = Tenzan was beaten by Kensuke Sasaki. - NJPW Budokan Hall (June '95) = Tenzan fell to the IWGP Champion, Keiji Mutoh. - NJPW Sumo Hall (August 11, '95) = Tenzan defeated Kensuke Sasaki. - NJPW Sumo Hall (August 12, '95) = Tenzan was pinned by Scott Norton. - NJPW Sumo Hall (August 13, '95) = Tenzan lost to Shinya Hashimoto. - NJPW Sumo Hall (August 14, '95) = Tenzan was forced to submit to Ric Flair. - NJPW Sumo Hall (August 15, '95) = Tenzan & Masa Chono beat Tatsutoshi Goto & Shiro Koshinaka. - NJPW Super Grade Tag League V (October 15-30, '95) = Tenzan & Masa Chono defeated Junji Hirata and Shinya Hashimoto in the Semis, then beat Osamu Kido and Kazuo Yamazaki in the Finals to win the League. - UWFI Sumo Hall (November '95) = Tenzan & Masahiro Chono took out Yoshihiro Takayama & Yoji Anjoh. - WCW Starrcade '95 = Tenzan lost to "Macho Man" Randy Savage. - NJPW Tokyo Dome '96 (Wrestling War) = Tenzan pinned Satoshi Kojima. - NJPW Tokyo Dome '96 (Battle Formation '96) = Tenzan was defeated by "Macho Man" Randy Savage. - NJPW Sumo Hall (April '96) = Tenzan lost to Shiro Koshinaka. - NJPW Sumo Hall (August 2, '96) = Tenzan submitted to Kensuke Sasaki. - NJPW Sumo Hall (August 3, '96) = Tenzan was beaten by Riki Choshu. - NJPW Sumo Hall (August 4, '96) = Tenzan defeated Shinya Hashimoto. - NJPW Sumo Hall (August 6, '96) = Tenzan & Hiro Saito lost to Yuji Nagata & Osamu Nishimura. - NJPW Japan/US All-Star Tournament (September 19-23, '96) = Tenzan defeated Arn Anderson, but lost to Scott "Flash" Norton. Kensuke Sasaki won the Tournament. - NJPW Super Grade Tag League VI (October 13 - November 1, '96) = Tenzan and Masa Chono competed in the League, which was won by Scott Norton and Shinya Hashimoto. - NJPW Tokyo Dome '97 (Wrestling World) = Tenzan & Masa Chono lost the IWGP Tag Belts to Kengo Kimura & Tatsumi Fujinami. - NJPW Sumo Hall (February '97) = Tenzan & Hiro Saito were beaten by Michiyoshi Ohara & Tatsutoshi Goto. - NJPW Tokyo Dome '97 (Battle Formation '97) = Tenzan forced Manabu Nakanishi to submit. - NJPW Budokan Hall (June '97) = Tenzan & Hiro Saito lost to Junji Hirata & Takayuki Iizuka. - NJPW G1 Climax '97 (August 1-3, '97) = Tenzan beat Tadao Yasuda, Satoshi Kojima and Shinya Hashimoto, then lost to Kensuki Sasaki in the Finals. - NJPW "The Four Heaven" (August 10, '97) = Tenzan fell to the IWGP Champ Shinya Hashimoto. - NJPW Three Gun Tag-Team Tournament (September 12-20, '97) = Tenzan and the Great Muta defeated Akira Nogami and Tatsumi Fujinami, and Osamu Kido and Junji Hirata, but lost to Kensuke Sasaki and Kensuke Yamasaki in the Finals. - NJPW Budokan Hall (September 23, '97) = Tenzan & Hiro Saito fell to Satoshi Kojima & Manabu Nakanishi. - NJPW Final Battle Hall (November 2, '97) = Tenzan, Scott "Flash" Norton and Michiyoshi Ohara defeated Satoshi Kojima, Tadao Yasuda and Manabu Nakanishi. - NJPW Super Grade Tag League VII (November 18 - December 8, '97) = Tenzan and the nWo Sting competed in the League, which was won by Masa Chono and Keiji Mutoh. - NJPW Riki Choshu Retirement (January '98) = Tenzan was beaten by Yuji Nagata. - NJPW Budokan Hall (February '98) = Tenzan was forced to submit to Manabu Nakanishi. - NJPW Tokyo Dome '98 (The Inoki Final) = Tenzan & Hiro Saito lost to Manabu Nakanishi & Satoshi Kojima. - NJPW Top of the Super Junior '98 (May 16 - June 3, '98) = Tenzan and Masa Chono competed in the League, which was won by Yuji Nagata and Kensuke Sasaki. - NJPW IWGP Tag-Team Title Tournament '98 (June 3-5, '98) = Tenzan and Masa Chono defeated Kensuke Sasaki and Kazuo Yamazaki, then beat Genichiro Tenryu and Shiro Koshinaka to win the vacated IWGP Tag Belts. - NJPW G1 Climax '98 (July 31 - August 2, '98) = Tenzan lost in the first round to Satoshi Kojima. - NJPW Sumo Hall (August 1, '98) = Tenzan, Keiji Mutoh & Big Titan won over Osamu Nishimura, Tatsumi Fujinami & Manabu Nakanishi. - NJPW Sumo Hall (August 2, '98) = Tenzan, Keiji Mutoh & Hiro Saito were defeated by Shiro Koshinaka, Kengo Kimura & Michiyoshi Ohara. - NJPW Rising the Next Generation (August '98) = Tenzan was beaten by Shiro Koshinaka. - NJPW Tokyo Dome (January '99) = Tenzan & Satoshi Kojima defeated Genichiro Tenryu & Shiro Koshinaka to win the IWGP Tag-Team Titles. - NJPW St. Valentine's Day Massacre (February '99) = Tenzan, Satoshi Kojima, & Hiro Saito fell to Masa Chono, Akira, & the nWo Sting. - NJPW Tokyo Dome (April '99) = Tenzan & Satoshi Kojima beat Yuji Nagata & Manabu Nakanishi. - NJPW Budokan Hall (June '99) = Tenzan & Hiro Saito were defeated by Osamu Kido & Kuniaki Kobayashi. - NJPW Sumo Hall (August 13th, '99) = Tenzan defeated Shiro Koshinaka in the G-1 Climax League. - NJPW Sumo Hall (August 14th, '99) = Tenzan was forced to submit to Manabu Nakanishi in the G-1 Climax League. - NJPW Sumo Hall (August 15th, '99) = Tenzan defeated Masa Chono in the G-1 Climax League. Manabu Nakanishi won the League later in the night. - NJPW Budokan Hall (September '99) = Tenzan & Satoshi Kojima lost to Manabu Nakanishi & Yuji Nagata in the G-1 Tag League '99. - NJPW Tokyo Dome (October '99) = Tenzan defeated Tatsutoshi Goto. - NJPW Tokyo Dome (January '00) = Tenzan pinned Chris Benoit. - NJPW Sumo Hall (February '00) = Tenzan was beaten by Manabu Nakanishi. - NJPW Dome Impact 2000 (April '00) = Tenzan won over Yutaka Yoshie. - NJPW Budokan Hall (June '00) = Tenzan, Scott Norton, & Satoshi Kojima defeated Kenzo Suzuki, Junji Hirata, & Shiro Koshinaka. - NJPW Sumo Hall (August 12th, '00) = Tenzan lost to Osamu Nishimura in the G-1 Climax League '00. - NJPW Sumo Hall (August 13th, '00) = Tenzan was beaten by Manabu Nakanishi in the G-1 Climax League '00. Kensuke Sasaki went on to win the League later that night. - NJPW Do Judge (October '00) = Tenzan & Satoshi Kojima kept the IWGP Tag-Team Titles, defeating Manabu Nakanishi & Yuji Nagata. - NJPW Wrestling World 2001 (January) = Tenzan defeated Yuji Nagata in the vacant IWGP Title Tournament. Later that night, Tenzan lost to Toshiaki Kawada. Kensuke Sasaki won the tournament. - NJPW Sumo Hall (February '01) = Tenzan & Satoshi Kojima defeated Riki Choshu & Shinya Makabe. - NJPW Osaka Dome (April '01) = Tenzan, Masahiro Chono, & Satoshi Kojima defeated Keiji Mutoh, Taiyo Kea, & Jinsei Shinzaki. - NJPW Budokan Hall (April '01) = Tenzan & Satoshi Kojima beat Steve Williams & George Hines. - NJPW Wrestling Dontaku 2001 (May) = Tenzan, Masahiro Chono, & Satoshi Kojima lost to Keiji Mutoh, Taiyo Kea, & Hiroshi Hase. - NJPW Budokan Hall (June 6, '01) = Tenzan, Akira Nogami, & Masahiro Chono were defeated by Jinsei Shinzaki, Taiyo Kea, & Jushin Liger. - AJPW Budokan Hall (June 8, '01) = Tenzan was beaten by Toshiaki Kawada. - NJPW Tokyo Dome (October 8, '01) = Tenzan & Satoshi Kojima fell to Riki Choshu & Osamu Nishimura. - NJPW International Center (October 28, '01) = Tenzan & Satoshi Kojima were defeated by Masa Chono & Mike Rotunda. - IWGP Tag Title Tournament (March 8-24, '02) = Tenzan & Masa Chono won over Kensuke Sasaki & Shiro Koshinaka, Hiroshi Tanahashi & Kenzo Suzuki, and Yuji Nagata & Manabu Nakanishi to win the tournament. - NJPW Toyko Dome (May 2, '02) = Tenzan & Scott Norton fell to Shinya Hashimoto & Naoya Ogawa. - NJPW "Fighting Spirit Memorial Day" (May 28, '02) = Tenzan defeated Kenzu Suzuki. - NJPW Sumo Hall (August 10, '02) = Tenzan was forced to submit to Masahiro Chono. - NJPW Sumo Hall (August 11, '02) = Tenzan & Osamu Nishimura fell to Yuji Nagata & Kensuke Sasaki. - NJPW Tokyo Dome (October 14, '02) = Tenzan was pinned by the Great Muta II. - NJPW International Center (October 26, '02) = Tenzan, Manabu Nakanishi, Takashi Iizuka, Osamu Nishimura & Yutaka Yoshie lost an "Elimination" Match to Tadao Yasuda, Kazunari Murakami, Ryushi Yanagisawa & Makai Masks #1 & #2. - NJPW Triathlon Survivor League 2002 (November/December) = Tenzan, Tatsumi Fujinami & Masa Chono competed in the league, which was won by Manabu Nakanishi, Osamu Nishimura & Yutaka Yoshie. - NJPW Tokyo Dome (January 4, '03) = Tenzan & Satoshi Kojima defeated Masa Chono & Manabu Nakanishi. - NJPW Sumo Hall (February 16, '03) = Tenzan & Masa Chono stayed the IWGP Tag Champs, winning over Tadao Yasuda & Kazunari Murakami. - NJPW Tokyo Dome (May 2, '03) = Tenzan beat Hiroshi Tanahashi. - NJPW Budokan Hall (June 13, '03) = Tenzan & Masa Chono lost the IWGP Tag Titles to Yutaka Yoshie & Hiroshi Tanahashi. - NJPW Sumo Hall (August 15, '03) = Tenzan forced Manabu Nakanishi to submit. - NJPW Sumo Hall (August 16, '03) = Tenzan forced Yoshihiro Takayama to submit. - NJPW Sumo Hall (August 17, '03) = Tenzan beat Jun Akiyama to win the G-1 Climax 2003 League. - NJPW Prefectural Gym (August 28, '03) = Tenzan forced Shinya Makabe to submit. - NJPW Tokyo Dome (October 13, '03) = Tenzan, Yuji Nagata, Manabu Nakanishi, Hiroshi Tanahashi & Seiji Sakaguchi fought in an "Elimination" Match against Yoshihiro Takayama, Kazuyuki Fujita, Minoru Suzuki, Shinsuke Nakamura & Bob Sapp. Tenzan was eliminated by Sapp, who 'survived' along with Suzuki. - NJPW G-1 Climax Tag-Team League '03 (October) = Tenzan & Osamu Nishimura beat Yuji Nagata & Manabu Nakanishi and Yoshihiro Takayama & Toa the Samoan Beast to win the league. - NJPW Yokohama Arena (November 3, '03) = Tenzan won the IWGP Title from Yoshihiro Takayama. - NJPW Tokyo Dome (January 4, '04) = Tenzan & Masa Chono fell to Bob Sapp & Keiji Mutoh. - NJPW IWGP Title Tournament (February 15, '04) = Tenzan defeated Kensuke Sasaki, Yuji Nagata and Genichiro Tenryu to win the tournament. - NJPW Sumo Hall (March 28, '04) = Tenzan was forced to submit to Shinsuke Nakamura. - NJPW Nexess (May 3, '04) = Tenzan, Osamu Nishimura & Shinya Makabe lost to Giant Machine, Super Strong Machine & New Strong Machine. - NJPW Sumo Hall (August 13, '04) = Tenzan was pinned by Osamu Nishimura. - NJPW Sumo Hall (August 14, '04) = Tenzan defeated Ryushi Yanagisawa. Tenzan later won, via forfeit, over Yoshihiro Takayama. - NJPW Sumo Hall (August 15, '04) = Tenzan forced Shinsuke Nakamura to submit. Later on, Tenzan beat Katsuyori Shibata and forced Hiroshi Tanahashi to submit to win the '04 G-1 Climax. - NJPW Sumo Hall (October 9, '04) = Tenzan & Yuji Nagata lost a "Lumberjack Death" Match to Masa Chono & Don Frye. - NJPW Masa Chono's 20th Anniversary (November 3, '04) = Tenzan & Yuji Nagata were beaten by Masa Chono & Riki Choshu. - NJPW Toukon Festival (November 13, '04) = Tenzan & Hiroshi Tanahashi fell to Toshiaki Kawada & Naoya Ogawa. - AJPW The Unchained World (December 5, '04) = Tenzan lost to the Triple Crown Champion, Toshiaki Kawada. - NJPW Prefectural Gym (December 11, '04) = Tenzan fought to a Draw with Satoshi Kojima. - NJPW Wrestling World '05 (January 4) = Tenzan lost a "Dog Fight" Match to Masahiro Chono. Riki Choshu was the other participant. - NJPW Sumo Hall (February 20, '05) = Tenzan lost the IWGP World Heavyweight Title to the AJPW Triple Crown Champ, Satoshi Kojima, who unified the belts. - NJPW Sumo Hall (March 26, '05) = Tenzan forced Manabu Nakanishi to submit. 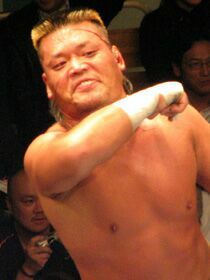 Later on, Tenzan defeated Masahiro Chono. - NJPW New Japan Cup '05 (April) = Tenzan beat Jushin Liger and Osamu Nishimura, then fell to the eventual winner, Hiroshi Tanahashi. - NJPW Tokyo Dome (May 14, '05) = Tenzan won the IWGP World Heavyweight Championship from Satoshi Kojima. - NJPW G-1 Climax '05 (August) = Tenzan competed in the league, which was won by Masa Chono. - NJPW Sumo Hall (August 13, '05) = Tenzan was pinned by Yuji Nagata. - NJPW Sumo Hall (August 14, '05) = Tenzan, Yutaka Yoshie, & Hiroshi Tanahashi fell to Yuji Nagata, Kendo Kashin, & Manabu Nakanishi. - NJPW Tokyo Dome (October 8, '05) = Tenzan, Yutaka Yoshie, Naofumi Yamamoto, & Takashi Iizuka beat Shinjiro Ohtani, Kohei Sato, Ryouji Sai, & Kamikaze. - NJPW Tokyo Dome (January 4, '06) = Tenzan & Masa Chono retained the IWGP Tag-Team Titles, defeating Shiro Koshinaka & Takao Omori. - NJPW Sumo Hall (February 19, '06) = Tenzan & Masa Chono stayed the IWGP Tag-Team Champions, beating Manabu Nakanishi & Giant Bernard. - NJPW Sumo Hall (March 19, '06) = Tenzan & Masa Chono kept the IWGP Tag-Team straps, taking down Yuji Nagata & Naofumi Yamamoto. - NJPW New Japan Cup (April '06) = Tenzan defeated Scott Norton, then fell to Hiroshi Tanahashi. Giant Bernard won the tournament. - NJPW IWGP Heavyweight Title Tournament (July 17, '06) = Tenzan lost in the first round to Akebono. Hiroshi Tanahashi won the tournament. - NJPW G1 Climax '06 (August) = Tenzan defeated Giant Bernard and Satoshi Kojima to win the league. - AJPW Real World Tag League '06 (November/December) = Tenzan & Satoshi Kojima beat Toshiaki Kawada & Keiji Mutoh and Ro-Z & Suwama to win the league. - NJPW G1 Climax Tag-Team League '06 (November/December) = Tenzan & Jushin Liger competed in the league, which was won by Masahiro Chono & Shinsuke Nakamura. - NJPW Wrestle Kingdom in Tokyo Dome (January 4, '07) = Tenzan & Satoshi Kojima fell to Masahiro Chono & Keiji Mutoh. - NJPW Sumo Hall (February 18, '07) = Tenzan & Taru defeated Masahiro Chono & Milano Collection AT. - NJPW New Japan Cup '07 (March) = Tenzan beat Shinsuke Makamura, then fell to Togi Makabe. Yuji Nagata won the tournament. - NJPW G1 Climax '07 (August) = Tenzan competed in the league, which was won by Hiroshi Tanahashi. - NJPW Sumo Hall (August 11, '07) = Tenzan was pinned by Akebono. - NJPW Sumo Hall (August 12, '07) = Tenzan & Toru Yano lost to Riki Choshu & Shiro Koshinaka. - NJPW Explosion '07 (October 8) = Tenzan fell to Hirooki Goto. - NJPW Sumo Hall (February 17, '08) = Tenzan, Tomohiro Ishii, Gedo, & Jado were beaten by Masahiro Chono, Riki Choshu, Shiro Koshinaka, & Super Strong Machine. - NJPW New Japan Cup '08 (March) = Tenzan took down Tomohiro Ishii, then fell to Togi Makabe. Hiroshi Tanahashi won the tournament. - NJPW Sumo Hall (August 16, '08) = Tenzan lost to Yutaka Yoshi. - NJPW Sumo Hall (August 17, '08) = Tenzan was pinned by Shinsuke Nakamura. - NJPW G1 Climax '08 (August) = Tenzan competed in the league, which was won by Hirooki Goto. - AJPW Pro Wrestling Love in Ryogoku Vol. 5 (August 31, '08) = Tenzan & Satoshi Kojima defeated Togi Makabe & Taru. - NJPW Destruction '08 (October 13) = Tenzan lost a "Chain Death" Match to Takashi Iizuka.